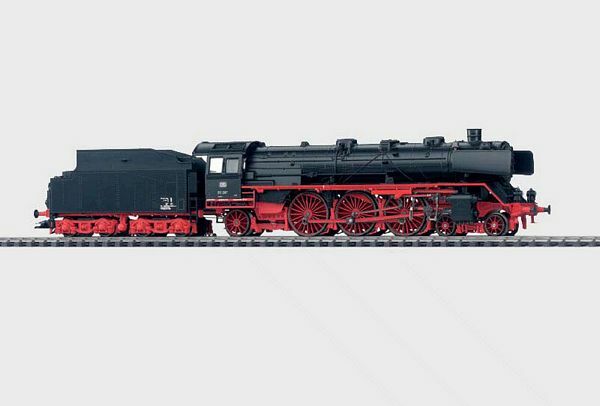 Prototype: German Federal Railroad (DB) class 03 express locomotive. Standard locomotive with Witte smoke deflectors and riveted tender. Model: With a digital decoder, controlled high-efficiency propulsion and running gear lights. 3 powered axles. 2 traction tires. 7226 smoke generator can be retrofitted. Headlights and smoke generator contact are conventional in operation, and can be digitally controlled. Running gear lights, as well as acceleration and braking delay with 6021 control unit, can be digitally controlled. Length over buffers 27.7 cm / 10-29/32. Running gear lights that can be digitally controlled.